For her first solo exhibition at KÖNIG GALERIE Alicja Kwade will be showing an installation as well as a new video work. 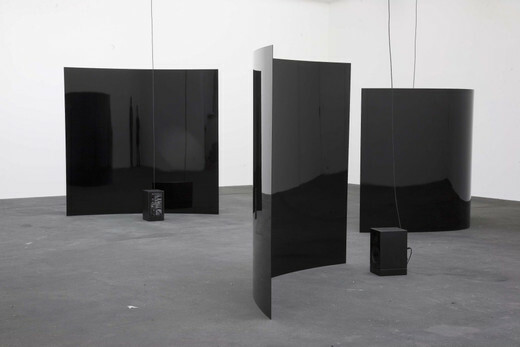 Eleven steel plates, lacquered in shiny black and varying in size, describe a sine curve's form in diverse frequencies. The plates, each having a different form, build a resonance mirror for the sonorous crackling and rustling coming from the speakers positioned in front of them. The speakers in turn, are connected with cables to the lighting tubes under the roof, whose sound will be played-back over a magnetic cartridge. Through acoustic amplification, Kwade makes electromagnetic waves audible as background noise while at the same time visualizing the complete physical foundation of light and sonic waves by means of the steel plates. The form of the wave distorts its own mirror image as it doubles itself at some points, while disappearing at others. Similarly, on an acoustic level, depending on the position, the noise is either reflected or overlaps itself, causing it to be louder or quieter as one passes by. Kwade works with the basic forces of physics which make up our world. She goes back to the origin of the universe, where matter, space and time emerged from a singularity at its zero point. She seeks to make the unpresentable graspable and finds a sensory correspondence for abstract phenomena, which only find their fulfillment in theory and are perceived by us only in a very small fraction as light and sound for example. In her new video work, the artist also questions our perception of reality. The looped film appears to show a meteorite, lightly floating through outer space, which moves through the image as it slowly turns from right to left. Actually, it is only a common pebble's flight, which was recorded with a high speed camera. Once again, the limits of our perceptual space come to light as Alicja Kwade, from an ironic stand point, pushes open the door to those worlds which lay hidden behind. With an installation outside of the gallery space, Kwade further delves into the parallel worlds of our perception. Two silver-colored Nissan Micras park in front of the entrance. One vehicle is the mirror image of the other. Not only is the steering wheel mirrored, but also the dent on the fender can be found identically on the other side of the second vehicle. Even the randomly scattered everyday items in the vehicle find their correspondence. The testimony of an accident is doubled in a mirror image made reality. Alicja Kwade (born 1979 in Kattowice, Poland) lives and works in Berlin, where she studied at the Universität der Künste until 2005. In 2008 she won the Piepenbrock Prize for Sculpture, which was conjoined with a large solo exhibition at the Hamburger Bahnhof – Museum for Contemporary Art - Berlin.